Serving Fresno, Clovis, Paso Robles, Central CA. 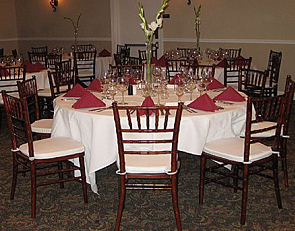 The Linen Shoppe in Clovis, California, specializes in bringing you the highest-quality table linens, centerpieces, and chair covers, for your special occasions. We deal with high-end, designer fabrics for an elegant look and style. Create an event to remember by choosing the design of your dreams. Our family-owned-and-operated company is proud to serve you. Serving Fresno County and San Luis Obispo County as well. Complement your wedding color choices by adding an overlay to your table setting. Our overlays are available in sheer organza, mirror organza, and satin fabrics. Coordinate the color with the chair sash or add another color to make your reception breath taking. 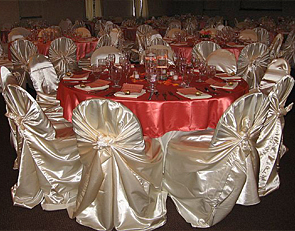 Our company can order coordinating napkins and linens for your event. 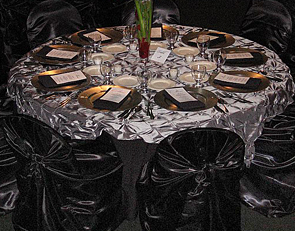 We have table linens that can go to the floor with a bottom layer and a beautiful overlay. 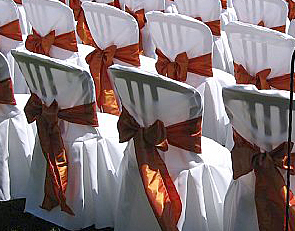 Chair covers are available in chocolate, black, white and ivory. They come in several shapes and sizes. Polyester and satin fabrics are available. Please call for the size and shape that would suit your wedding needs.